I’ve decided to start a series in which I look back on the previous month’s spending and saving and report how we matched up with our goals (i.e. budget) and what we spent out of our targeted savings accounts. The point is to give you a deeper look into how we spend our money (to provoke discussion) and to provide us some accountability. In April we had three weekends on which we were traveling, so I’ll separate our spending in those situations from our normal budget. Groceries (also includes drugstore items): We had an unusually low-spending month in terms of our groceries. We were regularly overspending our $300/month budget so we increased it to $360/month a few months ago and that’s been much more reasonable for us. This month was probably pretty low because of our two weekends traveling and we started getting our CSA box so we had produce and meat from that source. Gas: Our gas budget level is left over from when we had two cars and I had hoped that we would reduce it by 20% or so. You can see that we spent just about our full budgeted amount this month, but that included fill-ups on the 1st and 25th of the month, so it was probably just a high month that will smooth out with the surrounding months to give an average closer to that 20% reduction figure I had wanted. Restaurants: Nothing special to report here. We had take-out once (which we haven’t done in forever!) and went out to dinner with a large group once. Every month we also have some random other expenses that aren’t covered in the budget but aren’t supposed to be taken out of a targeted savings account. This month we are either getting reimbursed for the expenses or were covered by the excesses from other categories. 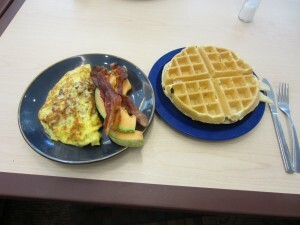 Atlanta meal: On April 1 I was traveling back from the case competition and I bought breakfast in the airport for $5.52. This expense (and my other meal that weekend from March) were reimbursed in early May. Luggage: Kyle and I received two lovely carry-on bags as a Christmas present. Unfortunately, while they were advertised as being carry-on-sized, they were a couple inches larger than the regulations in each dimension. (Watch out for this, by the way. When we called the company, they said they report their sized based on piping-to-piping measurements, meaning they don’t include the wheels or external pockets. How silly is that?) While we know that it’s quite rare for anyone to actually check that a carryon bag meets regulations, we decided to return these egregiously oversized bags and buy two more that were at least closer to the regulations. We paid for those bags up front and the family member who gave us the original bags reimbursed us as our gift. Taxes: We paid $67 in (additional) federal tax in April. Lots of spending out of this account this month! Tennessee Wedding Trip: I already wrote about and showed pictures from our weekend, and the total that we spent out of our savings for this trip was $413.23. Half of our hotel was paid for in March but the rest was from April. 5-Year College Reunion Trip: Our BIG trip this month was flying to CA for our 5-year college reunion. We bought our plane tickets and paid for our registration in February, so the money we spent this month was on food and gas. (We stayed with Kyle’s parents, so no lodging costs, and we borrowed their car, so no rental.) We ate nearly all our meals at the reunion, which we had paid for in advance. One of our friends took us out for breakfast (thanks CN!) on Saturday, on Sunday we went to brunch in our college dining hall for old time’s sake, and Kyle’s parents took us out to dinner on Sunday night before our flight. We filled up half a tank of gas on Kyle’s parents’ enormous car, so that was surprisingly expensive. We also parked our car at the airport while we were gone, which was $6/day. The total amount we transferred out of this account for the trip this month was $92.20. We spent $333 at the dentist this month. We don’t have dental insurance so we paid out of pocket for cleanings and diagnostics. We also refilled our BCPs this month and so transferred $30 from this account to cover it. We didn’t change any of our major budget categories this month. Starting next month we are shifting $45 from our going into our Cars savings account to adding to our Medical account savings rate. So that was April money-wise! 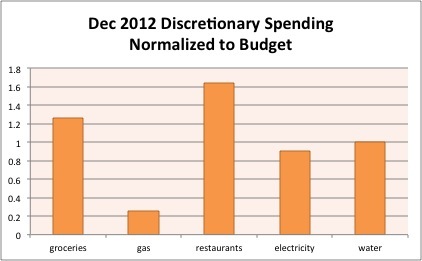 It was rather exciting because of our unusual amount of travel, but that reduced our normal-type spending. We ended up with a $98.29 surplus! I’m not zeroing out the checking accounts though, because we are putting an additional installment into Kyle’s Roth next month so we need almost an extra $100 for that. I hope I’ll be able to zero out at the end of May and transfer some extra money to savings. How was your April? Have you had many months that were as on-target/low-spending as our April (quite unusual for us!)? What happens to your budget in months that you travel a lot? 18 Responses to "April 2012 Month in Review: Money"
Believe me, this was a remarkable month! I decided to start posting this before the month even started, so I didn’t know it was going to be a big success having-money-left-over-wise right off the bat. My eyes went straight to the college brunch! I actually really, really miss college brunch. All those glorious Sundays of having an omelet station at the ready… ahhhh. I know right? And when you’re finished you just put all your dirty plates on a conveyer belt and they disappear! 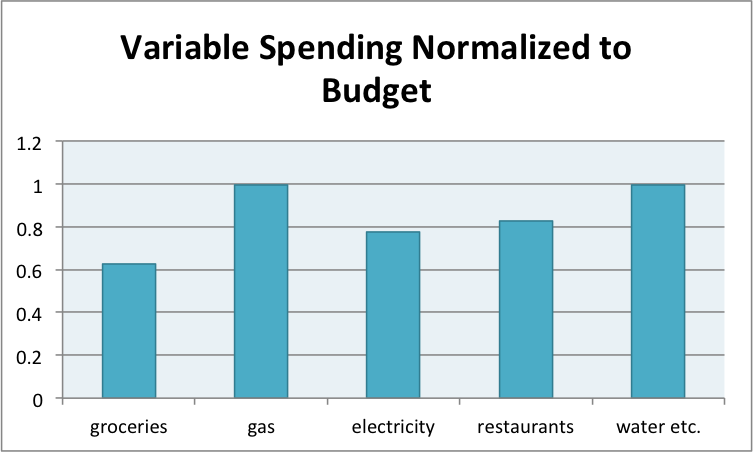 I like the normalized chart for variable spending! Great job sticking to your budget! I know it can be tough. I’m still working on mine and often find myself over in one or two categories, but it always evens out with room in other parts of the budget! Julia recently posted..I don’t like to buy things. That’s how our months usually go. A few times a year we have to dip into savings to cover or float to the next month, but most work out OK being over and under in different places. We’ve had a few months in a row with a bit of excess so that helps for this extra IRA payment next month. I love doing the “monthly review” each month. I always struggle with whether to look at the total amount spent for the month, or to subtract out large (but budgeted) expenses. For instance, last month we had auto maintenance and the reunion factored in to the final total. I suppose that’s where your dedicated savings accounts makes a lot of sense. I definitely feel more successful looking at how spending lined up with the budget rather than total spending. We have rather large swings in spending (this month: car insurance (6 month payment) and season tickets to Broadway shows – huuuuundreds of dollars), which stink without the savings accounts. But the months where you don’t have those huge expenses also kinda stink because you should be saving all that money but you want to spend it because it’s there (or at least I would). Sooo yeah. Targeted savings FTW. I know the feeling about surplus months….ahhh!!! That’s why I like hiding it from ourselves in our savings accounts. I know what you mean about gas. I seem to fill up 2-3 times in a month or zero. So I filled up zero times in April, but 2-3 times in March and I’ll probably fill up twice this month since I’m going to visit a friend and my parents, which is probably actually almost a full tank when I add it all up… So I’ll fill up before I head out next Thursday/Friday and then fill up just after I get back or on the way home (probably on the way home since then I can get gas in the middle of nowhere instead of in the city). I probably won’t fill up again this month though after those two times and then I’m heading on a plane trip, so June could be a 0-1 fill-up month. I don’t understand why the luggage companies do that… Do they realize what they’re designing carry-on baggage for?! In the months that I travel a lot, I find that I spend less money on gas and food since it comes out of my travel budget instead. Usually when I go to visit my friend who lives near my parents though I don’t spend as much on entertainment since she is on a much lower budget than my local friends, but I probably make up for that by spending $40-50 on gas for the trip. This is the first month I’ve laid it out all nicely with text and such – usually I just glance at Mint and play with Excel to figure out if we are in the black or the red. I can’t even tell you how much time and energy we put into deciding or not to keep the luggage. We had multiple debates. We called the manufacturer. We looked up airline regulations. We visited the retailer twice. I think the issue is that the airlines were not sticking to their regulations, which is a major problem now that EVERYONE is taking the max carryon possible because of the baggage fees. But now we’re all invested in these huge carryons and people would throw fits if all of a sudden they airlines made basically everyone check their luggage. Ugh. Anyway, we ended up with luggage that basically meets the regulation so it might be kind of over once it’s filled with stuff. We aren’t going to travel for sure again until September (maybe June) so we should have a few normal/possibly overspending months. What a sham on the luggage! I can’t believe they do that; my angry self probably would have called the BBB. Even if it didn’t do anything, it’d make me feel like I’d done something to amend my inconvenience. femmefrugality recently posted..Use Your Library, People. Well, we called the manufacturer and tried to get the customer service person to at least admit that the way they measure the bags does not reflect, like, REALITY. But she was just like, “This is the way it’s done.” In the end we voted with our dollar so I think that’s the best thing. Really? I thought it was pretty run-of-the-mill tracking. Just packaged up as nice as I could. We do have an Electronics savings account from which we bought to laptops last summer. We used mostly found money. It eased our minds quite a bit. No spending at all in entertainment? What did you guys end up doing? Out of town three long weekends, dinner out with friends, church small group meetings every week, a musical at our local theater, Easter service and brunch with friends… and a lot of Netflix/video games.